Squash Tokens are available from the bar at the Boat & Horses. Food is available so anybody who fancies some food after a game could try the pub. The Club night is open to all members and is a great opportunity to meet new opponents and test your skills against players of all abilities. Howard, the club coach, will be there, to offer tips and advice to improve your game. In April we have amended the date of Club Night to avoid the Easter break. Club night will take place on Tuesday 30th April from 6:00pm. From May, we propose to change club nights to a Wednesday evening. In May, to avoid the bank holiday week, Club Night will be on 30th May. It is time to renew your Trent Vale Squash Club membership for 2019. And yet again there has been NO increase in fees. Please choose from one of the available ways to rejoin. Last year's website account will be removed shortly. The club gate and door have combination locks. You can find details here. Beginners and Improvers group sessions at Trent Vale Squash Club. The course is a six week course and costs just £45. Why not call in after your game, get a token for your next game and enjoy a drink. Latest on the new facilities. Details can be found on our new development page. I have a group squash coaching course beginner / intermediate standard starting on Saturday 22nd August 10:30-11:30 for six weeks. On the course we cover a variety of things including drives, volleys, serves & return of serves. We also go through shot selection and match practise. The sessions are good fun and varied. There is also a wide variety of players that you could possibly arrange friendlies with. If you would like to come but might miss some sessions then I can take you on court yourself to go through what you missed or do something else of your choice. The cost of this block is £40.00 plus a small court charge split amongst the group each week. There is still a couple of places available. If you would like to come then please either e-mail me or contact me on 0791 287 7042. Want to improve your squash? On the course we will be looking at all the things to improve your game - technique, shot selection, drives, volleys, boasts. controlling the 'T' Zone. The session will be based around drills practise as well as conditioned games and match practise. The course will cost £40.00 for the block plus a small charge towards lights each week which will be split amongst group. Please contact me on 0791 287 7042 or e-mail lisasquash@hotmail.com if you wish to reserve a place. Have you re-joined the club for this year? Have you got the 2015 login details for the website? Last year's account has now been deleted. We have a group squash coaching course starting on Wednesday 3rd December for six weeks 4.20 - 5.20.... will suit those earlybirds that manage to finish work before 5!! The course will stop on Wednesday 17th December for Xmas then resume again on Wednesday 7th January. On the course we will be looking at all the things to improve your game - technique, shot selection, drives, volleys, boasts, controlling the 'T' Zone. The session will be based around drills practise as well as conditioned games and match practise. The cost of this will be £40.00 for the block plus a small charge towards lights each week which will be split amongst group. Please just let me know if you would like more info or indeed would like to sign up. My contact no is 0791 287 7042, email: lisasquash@hotmail.com. GRADES - A/B/C/D/E/U Plate Events for 1st Round Losers. Get yourself down to the club this Sunday, 14th September. Still only £2!! Play until 8:00 or when we get tired.. see you there. We have a beginners squash coaching course starting on Saturday 1st March for six weeks. The cost of this will be £40.00 for the block plus a small charge each week for courts which will be split amongst group. This course is aimed at people who have just started to play or are playing in lower leagues. We look at your technique, shot selection, match practise, volleys, drives plus lots more. There is also an element of fitness at the end of each session!!!! 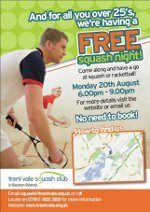 The membership for Trent Vale Squash Club runs from 1st January to 31st December. So membership for 2014 is due now. The good news is that yet again, the membership fee has not increased from last year !!! Once you have rejoined, make sure someone has told you the new website login details. The 2013 login will not be available for too long. Want to know more? Want to go? If you are interested, I can send you more details. Is anyone interested in the East Midlands Regional Racketball Closed Championships 2014? It is taking place on Sunday 9th March at Nottingham Squash Rackets Club. Closing date for entries is Friday 28th February. We have an improvers squash coaching course starting on Wednesday 15th January for six weeks. The cost of this will be £40.00 for the block plus a small charge each week for courts which will be split amongst group. For those of you wanting to improve your squash this year this is a great way to do it. We look at your technique, shot selection, match practise, volleys, drives plus lots more. There is also an element of fitness for those that have eaten too much turkey over the festive period!!!! Please just let me know if you would like more info or indeed would like to sign up. My contact no is 0791 287 7042. We are getting the plaster on the courts fixed and the lights replaced so the courts will be closed from Tuesday, 17th December. From 17th to 25th December 2013. This is the Biggest Doubles competition in the country and is always a fantastic day at the Nottingham Squash Rackets Club. There will be prizes for all grades provided by Harrow and TonySquash, and Cash prizes for the A Grade winners and runners-up! Want to give that special someone an icentive, something new and challenging? Why not treat that someone special to Squash or Racketball Lessons? Gift vouchers for Squash and Racketball Lessons are still on sale!!!! Please contact me on 0791 287 7042 for more info. 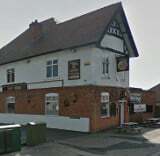 Mon 25th November 2013, Crown Inn, Beeston, 7:00pm. Minutes from previous meetings: AGM and committee meeting. I have a new block of beginner / intermediate squash group lessons that start on Saturday 2nd November for six weeks. cost will be £40.00 for this block plus a small charge each for court lights. Manchester - 26th October - 3rd November 2013. Its Club Night this coming Tuesday, 14th. Following on from mixed success in 2012 Trent Vale 2 (Mens team) winter league, I am proposing a 2013 Trent Vale 2 (Mens) team for the Winter leagues. If there is anyone wanting the opportunity to play more squash, against new players from different clubs, in different locations, them please contact me ASAP. The team will be in one of the lower division of the Notts league. The season starts at the end of September, about 8 games are played before Crimbo and 8 games after. Also, we need about 10 people to constitute a squad (however more would be great!) with 5 playing in any one match. If any ladies feel up for the challenge, I don't think this league precludes this. Information about the Coach Education Programme. 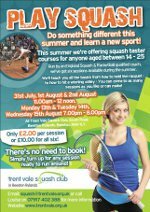 Just letting you know that I have a six week improvers squash coaching course starting on Wednesday 14th August 6:00 - 7:00 at Trent Vale. The cost of this is £40.00 for six weeks plus a small charge for the courts each week. This month is a great time to sharpen up your squash just before the new season starts. On this course we cover volleys, movement, straight drives, serves & returns, shot selection plus more. It really is about moving you on to that next level!!!! If you wish to know more info or would like to sign up for this then please e-mail me at lisasquash@hotmail.com or feel free to call me on 0791 287 7042. Its Club Night this coming Monday, 29th. Here are a few pictures Fitz took of the recent court referb. You will have noticed that the courts are white and gleaming as we have had the floors and walls repaired. We have used the money that we have generated as a club to pay for this significant investment - so thanks to you all for your continued support. Can we just remind you that you need to wear non-marking shoes on the floors. There are already some black marks on the new floors. Tut tut. The next improvements will be decorating inside. We'll let you know when this is going to happen. And we may get the grass mowed this year!!! Please add your support for squash to be included in the Olympics in 2020. VOTING UNDERWAY - SQUASH NEEDS YOUR HELP!!! Please register your vote for squash to be included in the Olympics 2020 and your help will be greatly appreciated and very helpful to the bid. Vote for Squash at Inside The Games. Does anyone fancy some fun semi-competitive squash? There is talk of a Notts summer league if they get enough interest from the clubs. You don't have to be a good player as its just for fun. We did this before and had a mixed team - men and women - and it was enjoyable. It would mean about 3 home and 3 away games. They need to know by 25th May so can you reply before this to me? Our congratulations go out to Chris Bray who sneaked into the lead at the last moment to take the coverted title of 2012 Player Of The Year, Chris wins free membership for 2013. Please note that Trent Vale Squash Club membership remains unchanged again for 2013! The tournament hailed as the 'Wimbledon of Squash' is the most iconic squash event in the world and is being staged for the first time ever on a football pitch at the KC Stadium between 20-26 May. Congratulations to our winners Fitz Haye and Frank Noonan plus Chris Bray who is the raffle winner. And a big thank you to Nic Grundy for organising the event. 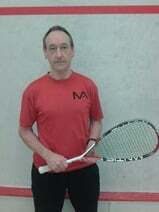 Full coaching from England Squash qualified coach. All levels from complete beginners to experienced players. This is an open evening for new players to come and have a go at squash or racketball. Anyone fancy watching some proper squash? A date for your diaries. No I am not referring to the women's team, but to the national leagues which take place at the Park Squash Club. The next home match is on Tues 27th March and it could be a decider for Notts. Let me know if you want tickets and I will ask somone to reserve them for us. Cost is £6 per ticket. who has just been upgraded to a tournament referee. Sandra, who plays for our women's Derbyshire team and our men's Notts team, is now facing 3-5 years' hard work to try for the national grade. who has won the Derbyshire Squash & Racketball County Closed Squash Championships 2012 in January. Well done Heidi. Don't forget that as well as the Yahoo Group, Trent Vale has got its own Facebook group for discussions and keeping in touch. The Facebook group has just been upgraded to the new Facebook group format. Why not check it out now. Racket Restring: In the Nottingham Tennis Centre on University Boulevard, there is a shop called EDGE which sells rackets, clothing and a racket restring service. Trent Vale Squash Club members can get a discount of 25% on a racket restring. Make sure you take your club membership card. Asics Gel Rocket Squash shoe: Edge now carry the Asics Gel Rocket Squash shoe which retails at £45. Edge are able to offer Trent Vale Squash Club members a 10% discount off this price. More details on the club's perks page. Read the rest of the Club News.